A year ago today, I put up my pre-order for Fractured Fairies, starting my Baker's Dozen Experiment. All of the short stories have been published in that experiment, but now it's time for my long awaited novel to be released! Coming to the end of the experiment doesn't mean I'll stop publishing - of course not! I have many planned titles, but I just won't be doing a monthly release schedule. Let's face it, keeping up that kind of schedule is hard without kids, and I still have a toddler at home that makes it hard to write. Oh, you want me to stop rambling? Sorry about that. Force of habit. Today, the pre-order for Mind Behind the Mind, the first novel in my Trinity Torn series, is up on Amazon! Release date is October 13, 2016. It will be available in paperback and at other retailers in the future; dates to still be determined. What's the great thing about the pre-order? Well, I have it at a discounted rate. 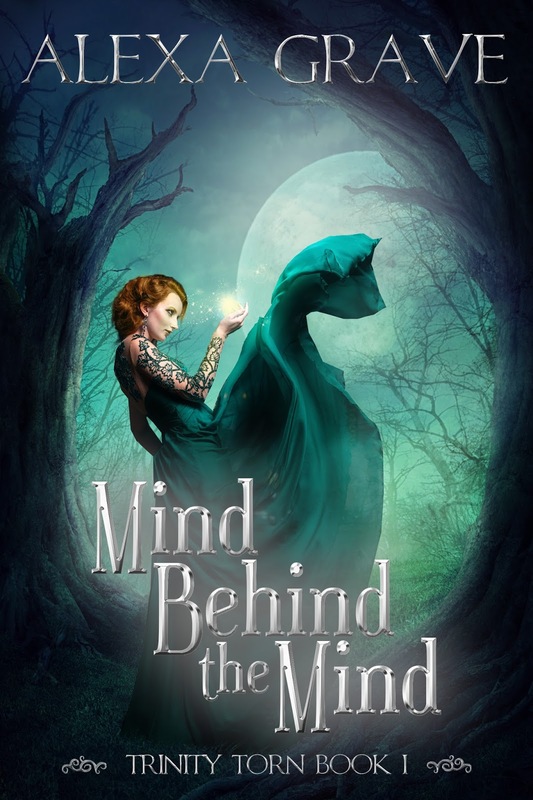 Mind Behind the Mind is currently available for $2.99, but when it goes live on October 13, the price will go up! So, if you want the lower price, snag a copy now. I suppose you'd like some kind of sneak peek. For now I have the blurb below - you'll have to wait for release day for an excerpt (my newsletter subscribers got to read a snippet, so if you want an earlier peek for future releases, please Sign Up). And below the blurb is the cover for Mind Behind the Mind. I think it's beautiful, but I'm biased. The cover art (excluding the text) was done by AM Design Studios. In a world where people believe the crimson sun is a dead witch’s head and the witch hunter who killed her stalks the night sky, a witch who ventures outside of Haven risks losing her life. Tessa is one such witch. Like many of her kind, she hopes to help the people of Leera, not harm them, and she’s on her first mission to heal an ailing man named Jeremiah. But when she crosses paths with a witch hunter, instead of avoiding him like she knows she should, she succumbs to her desires and ends up in his bed. The local Enforcers believe a witch is behind Jeremiah’s sickness, so they call Bastian to town. He’s a young witch hunter who normally has a knack for sniffing out witches. But when he runs into the striking Tessa, she scrambles his senses. He’s inexplicably drawn to her and abandons his usually cautious nature. As Tessa and Bastian uncover clues about Jeremiah’s illness, Tessa has to face the possibility that another witch may have had a hand in the incident. And if Bastian learns she’s a witch, he may point his finger at her. Then her head will surely roll. Happy release day! 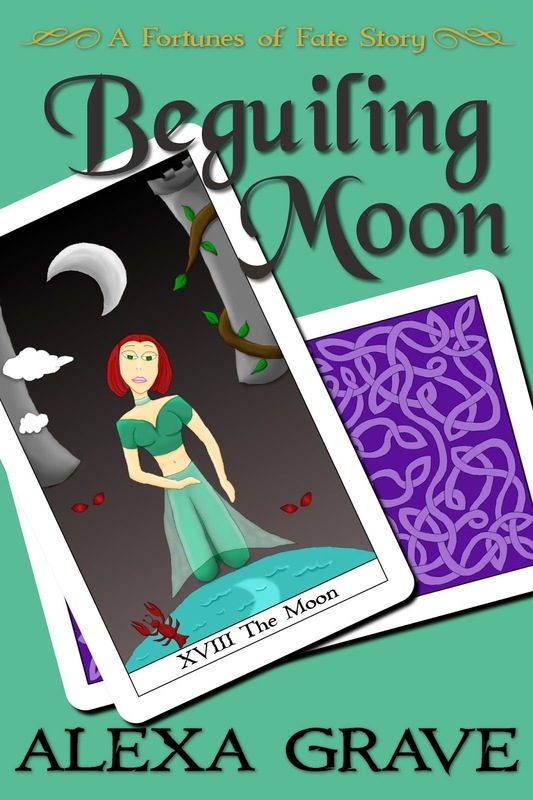 This time Beguiling Moon, the fifth Fortunes of Fate story, is available for purchase on Amazon. A little bit of passion mixed in with fighting against true nature! Although we get a cameo from Darney in this story, you do not need to have read any of the previous stories to dive right into this one. And with this release, the short stories in my Baker's Dozen Experiment have come to a close. Yes, I've published 12 short stories in the last 12 months! But we need a 13 to make it a Baker's Dozen, right? My novel, Mind Behind the Mind will be the end cap to my experiment. If you want an early look at the cover, sign up for for newsletter (that form there off to the left) -- I'll be sending a cover reveal out tomorrow! Next week Friday, though, I'll post here with the cover and a blurb (and maybe even a pre-order link). Guess I should get on with what you came here for. Without further adieu, an excerpt from Beguiling Moon. The power surged through Ero. Her legs trembled and her emotional distance shattered. Guilt and shame rushed in. Oh, Aelwyn. She gasped for air. It drew Keeper Hris's attention. She made haste toward Ero, or as much haste as she could with that damnable cane of hers pounding on the wood floor with every step she took. The jarring couldn't even unsettle the severe bun on the top of her head, her blonde hair, streaked with gray, remaining fixed and immovable. Once she reached Ero, she leaned in close and sniffed her. A grin spread across her face, like a cat who'd just caught an enormous mouse. "Ah. It's about time, Erolisi. I knew you couldn't resist for much longer." Wicked woman. What did she know of what a Beguiler went through? She had no magic of her own. Her skin looked washed out, a pale peach that had grown yellower as she aged. It almost looked the color her hair once was. Ero wouldn't satisfy her with assent. "You seem to be having some troubles containing the power. I'll arrange a transfer for you immediately." "No." She wouldn't be forced. There had to be a way to contain it. "No?" Hris banged her cane on the floor three times. "I've never met such a stubborn Beguiler in all my years." "Whip me. I don't care." She'd been punished plenty for holding out once she'd hit maturity. The pain of the lash was nothing compared to what the Keeper expected of her. Hris cackled. "I don't need to punish you. The power inside you will eat you alive if you don't release it. Let's see how far you get before you break down. Again. This time, though, you risk your life by clinging to your stubborn ways." And with that, she dismissed Ero as quickly as she had been drawn to her, heading down the line to inspect and scold the others. The hunger inside must be fed. Erolisi's fought against her power her entire life. King Mayven of Cedar is desperate for an upper hand on the battlefield, and he's enslaved the Beguilers so he can use their magic. Erolisi refuses to be used. But in a moment of weakness, she gives in, feeding her need by drawing life force from her best friend, Aelwyn, and shattering their relationship in the process. Now the energy Erolisi took must be released, fed to a warrior of Cedar to bolster his strength. This time she's determined to resist her power's call and no longer be a pawn. If she succeeds, though, her own magic will end her life. 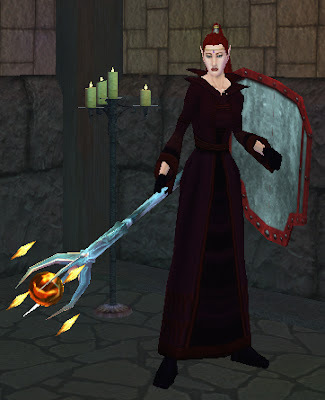 The Adventures of Karriya the Wizard is a series based on the main character I play in Everquest. Though most of what I write actually happened, many events might be embellished and exaggerated to create a better story. Happy hunting (and reading)! ❦ On the hot summer day of August 17, 2004, Kariya (yes, one R here - not a misspelling!) the Wizard was born in Everquest. OK, I'm not actually sure what the weather was like, and she wasn't so much born as created because let's face it, not many MMOs take characters through childhood. But that's beside the point. Suspend that imagination of yours already! Now, Kariya was a haughty little High Elf, roaming the Greater Faydark, close to her home of Felwithe. Though the mobs she faced were pathetic, to her they were monumental. Until she grew up and could mass kill the whole zone with a single spell... That may just be the haughtiness showing through, though. Anyway, she took up with a berserker named Yushuv -- a scarred Barbarian of few words. Together they eventually found a home in the guild Hands of Prophets. That guild changed to Legacy of Prophets before it faded completely, but I think I'm getting a bit ahead of myself. While in Hands of Prophets, Kariya met many friends, most of which have disappeared into the ether. A couple, though, she still cavorts with today. One such being a well-mannered druid by the name of Rondor, and another an uber paladin called Eaiana. And she of course can't seem to shake that sometimes grouchy Yushuv. Never! And then came a day of doom, where all those in Prophets feared for the outcome of all of their friends. A server merge. See, Kariya started out on Morden Rasp, a rather young server, and Morden Rasp was to be merged with Povar, one of the oldest servers. If someone had the same name as you on another server, the person who had the most time played would get to keep the name. The other person, would receive the dreaded X.
Kariya didn't get by the server merge unscathed (nor did several other of her family living on the same account -- that's how Leera the Beastlord became Maeve... and then following another sever merge, Maevve). The X of doom made her weep. She didn't want to be known as Kariyax! Those who received the evil letter were allowed to change their name, and so Karriya (who thankfully didn't get the X again in a future server merge) had her name legally changed. She still hates the extra R, though. Time passed quickly in the land of Norrath. Prophets dissolved, she joined a guild called Valheru, which eventually changed to Sanity's Edge, and then she left that guild as well. And then, she made a guild of her own -- Dark Possession. I mean, haughty High Elves need to be in charge, right? Yushuv, the stubborn berserker, eventually joined her, as did some of Rondor's and Eaiana's aliases (*coughs* alts -- the name we give to characters that aren't mains). It was an active guild for a while, but as we've seen, things always change. Dark Possession is still Karriya's guild, and she's littered the guild hall with cats, dogs, gnolls, and birds. There just aren't as many other active people in the guild aside from her aforementioned cohorts who often switch between many alts. So, there you have it. Wait. I'm forgetting something? Oh, someone. Of course. Karriya is the clear hero of the story, and every hero needs a sidekick! On March 5, 2006, Downpour, the Halfling druid who loves to hug everyone in her path was born. She's neglected once in a while, being left behind on occasion when Karriya wishes to venture out on her own, but for the most part Karriya makes sure to drag her along on her adventures, especially since the little druid can track mobs wherever they go. And so is the origin of Karriya the Wizard (and Downpour the Druid)! Now, over 11 years of adventuring under her robe, Karriya's happy to share her most recent adventures in Norrath. Who knows what she'll find with the stoic Yushuv or dragged into by the fastidious Rondor (who often plays his alt Wondora, a Dark Elf shadow knight, when wandering with Karriya). Watch for the latest adventure! Maybe she'll even slay a dragon! Or just a bunch of blobs. Not all adventures are glamorous.